Isn't it Time We Call the Thing "Dodgers Flight" Already? March 17, 2010, 6:45 p.m. Savvy Los Angelinos know plenty about Angels Flight. And you loyal BaseballSavvy readers know how I feel about the employment of the word "Angels," when "Dodgers" is readily available for use, and almost universally a better fit. For the rest of you, read yesterday's Los Angeles Times cover story on the just re-opened downtown L.A. funicular, along with my refresher below. It's pretty simple, really. I prefer Los Angeles Dodger blue to Orange County red, and all it stands for. And I think, nay, I know blue is the prettier color. So wherever possible, when I see the written word, or hear the spoken word "Angels," I replace it with "Dodgers." You know, as in the City of Dodgers, Dodgers in the Outfield, Only Dodgers Have Wings, and Dodger Berroa. It's been Dodger food cake for as long as I can remember. In a blurb called "Dodger Investors," I've been known to run this group of sentences from time to time: "BaseballSavvy.com is a growth enterprise. I’d say we’re looking for Angel investors, but that’s vulgar, and I promised my mother. Invest a thimble full of venture capital today; make major league minimum tomorrow." So now that Angels Flight is back in action, yet again, what do you say we insure its good will, and christen the thing with a new and superior name. Better late than never. 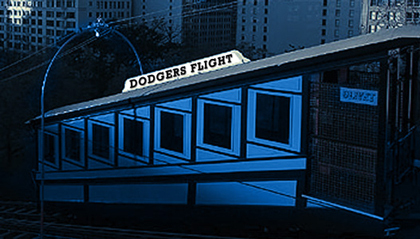 Dodgers Flight rolls off the tongue much more tastefully, don't you think? A proper dose of civic pride is in order, don't you think? And off with that hideous OC-like red paint job already. A little Photoshop goes a long way in providing a blueprint. Roster Rumblings: It's nice of Joe Torre to take the high road regarding Ronald (Visa Problems - They're Everywhere You Want to Be) Belisario, but there's no way the AWOL relief pitcher makes the club coming out of Spring Training. He'll be on the restricted list, if he manages to show up at all. Cory Wade is down for the count again too, and it's a shame. Surgery and half a season lost at the very least. Probably all of it. I imagine both Wade and management have earned their share of the blame here, and probably a bit more of the latter than the former. But not to worry. The club couldn't have been counting too seriously on Wade, and Ned Colletti has what seems like hundreds of pitchers on minor league deals (including actual minor leaguers), almost all of whom are pitching at or near big league level. Even if Hong-Chih Kuo misses some time again this season, which is a distinct possibility, the Dodgers have the reinforcements. I don't know if Ramon Ortiz is for real or not, but it wouldn't surprise me all that much, and he sure looks good righ now. He pitched well as both a reliever and starter in the hitter-friendly Pacific Coast League in 2009, posting an ERA of 3.05, with a couple of complete games. And it's not like he's coming back from an arm injury. Russ Ortiz, on the hand, looks more like an Albuquerque rotation-filler than anything else. But there's no harm in that. Both Eric Stults and Charlie Haeger are on-the-brink pitchers out of options, and the club is going to give them every possible chance at earning a job. Though it's not an ideal role for either man, both could start the season in the bullpen. Or one could, with the other filling the fifth spot in the rotation. I liked the Josh Towers acquisition at the time, and he's pitching well now, but Rule 5 pitcher Carlos Monasterios either stays with the big club the entire season or gets offered back to his original club – the Phils – so all things being equal, it'll be Monasterios who sticks. Basketball Savvy: Well, it’s March Madness time again, and not a minute too soon. Cause you just don’t hear “he’s got numbers” and “the big dance” uttered nearly enough the other 50 weeks of the year. And memo to earth's broadcasters: The phonetics of what are now perennial tournament participants are ZAV-yer – not EX-av-yer – and Gone-ZAG-ga, rather than Gone-ZOG-ga. And no, I don't know why phonetics isn't pronounced like it's spelled. More importantly, with Connecticut missing the NCAAs, we'll be spared the site of that odd-looking mascot of theirs, and what a hideous Siberian Husky-impersonator-of-a-dog that thing is. IBWAA Membership Drive: In celebration of its first full calendar year and second season in existence, the Internet Baseball Writers Association of America (IBWAA) is holding a membership drive, with fees reduced 50% for new members.